Electricity Generation. 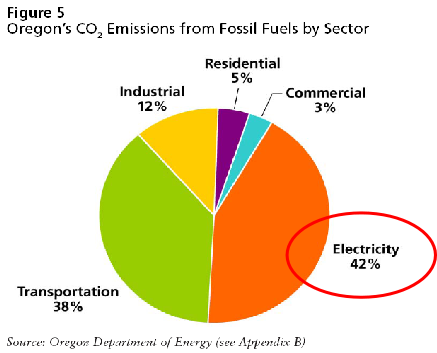 Electricity was the major source of CO2 from fossil fuels in 2000, representing 42 percent of those emissions. Emissions from electricity grew 17 percent from 1990 to 2000, but its relative contribution stayed the same. The Department calculates emissions from electricity generation based on the carbon content of the regional mix of electricity for the 11 contiguous western states. The Department took the average carbon content from 1990 through 2000 and applied that to electricity loads. While some states inventory only emissions from generating facilities within the state, the Department believes a regional carbon mix better reflects the carbon mix associated with the delivery of electricity to Oregon’s consumers. The No Pain Option to cut CO2 - Why Don’t We Do It? Oregon’s first greenhouse gas reduction goal is 40% below business as usual. Since 42% of greenhouse gas emission is from electricity generation, all we have to do is shut down ALL fossil fueled electric generation and replace it with the ONLY PROVEN LOW COST alternative: nuclear.